Others(Made in China) HuaWei/ BBK / VIVO / Lenovo are nonsupport.Because the phone's supplier blocked peripheral camera function. 5.5MM Lens with 6pcs adjustable LED lights waterproof. Built-in IC of enhancement and unification signal, has better stability. Power Supply 5V DC via USB, Appropriate for surveying pipes, equipments, furnishing, installation, underwater viewing, parts assembly, construction sites, workshops, laboratories,education, wildlife surveillance, car maintenance and repairing, hard-to-reach areas, etc. 6pcs LED lights can reach most of areas, extend your hands and eyes. 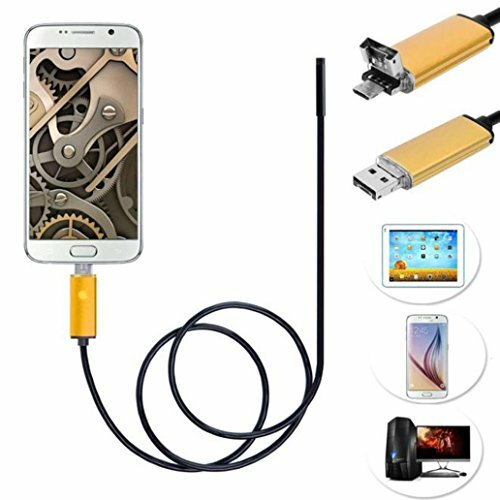 Noticed: Support Android phone has OTG and UVC function; (USB On-The-Go) An enhancement to the Universal Serial Bus (USB) that enables portable devices to be cabled together via USB without a computer in between. OTG creates a "dual-role" device that can act as host or peripheral; (USB-Video-Class) is a USB device class that describes devices capable of streaming video like webcams, digital camcorders, transcoders, analog video converters and still-image cameras.